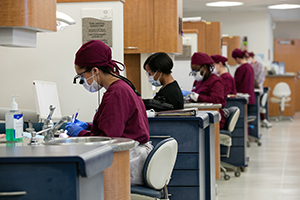 Since the Community College of Baltimore County (CCBC) School of Health Professions opened its state-of-the-art Dental Arts Center at CCBC Dundalk, MD, in 2008, the college’s dental hygiene clinic has recorded more than 18,000 patient visits. 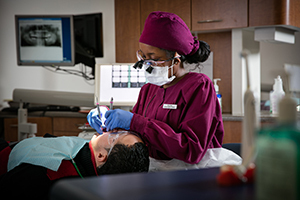 A service of the CCBC Dental Hygiene program, the clinic offers preventive dental services to people across the state of Maryland at significant savings over general dental fees, with discounted rates for CCBC students and alumni, senior citizens and the general public. In fact, from spring 2009 through spring 2016, CCBC estimates that clinic patient fees, compared with those charged by general dental practitioners, saved patients $5.8 million. “The hardest barrier for us to overcome has been the misconception that we provide dental hygiene preventive services only to residents of Dundalk or eastern Baltimore County,” notes Dr. McNamara. “In fact, our education program, as well as our clinic services, are offered statewide. And we work closely with the health department and general dentists in the area to make sure our patients receive the level of care necessary for maintaining good oral health,” he explains. In addition to its dental hygiene program, which is currently available only at CCBC Dundalk, for years the CCBC Continuing Education has offered classes leading to a Dental Assistant Certificate. Dental assistant classes currently are held at CCBC Dundalk, and will expand to CCBC Randallstown at Liberty Center in November 2016. While the Dental Assistant Certificate program can be completed in 16 to 20 weeks, the Associate of Applied Arts in Dental Hygiene is a two-year credit program that includes a summer session. This full-time program, which prepares students for licensure as dental hygienists, requires admission through CCBC Selective Admissions. Published on October 12, 2016.